Minority: Baltics (Estonia, Latvia, Lithuania), Serbia, Caucasus Azerbaijan, Georgia), Moldova, other former Soviet states. Maximum extent of European territory inhabited by the East Slavic tribes - predecessors of Kievan Rus', the first East Slavic state - in the 8th and 9th century. The East Slavs are Slavic peoples speaking the East Slavic languages. Formerly the main population of the loose medieval Kievan Rus federation state , by the seventeenth century they evolved into the Belarusian, Russian, Rusyn and Ukrainian people. Researchers know relatively little about the Eastern Slavs prior to approximately 859 AD, when the first events recorded in the Primary Chronicle occurred. The Eastern Slavs of these early times apparently lacked a written language. The few known facts come from archaeological digs, foreign travellers' accounts of the Rus' land, and linguistic comparative analyses of Slavic languages. Very few native Rus' documents dating before the 11th century (none before the 10th century) have survived. The earliest major manuscript with information on Rus' history, the Primary Chronicle, dates from the late 11th and early 12th centuries. It lists twelve Slavic tribal unions which, by the 10th century, had settled in the later territory of the Kievan Rus between the Western Bug, the Dniepr and the Black Sea: the Polans, Drevlyans, Dregovichs, Radimichs, Vyatichs, Krivichs, Slovens, Dulebes (later known as Volhynians and Buzhans), White Croats, Severians, Ulichs, and Tivertsi. There is no consensus among scholars as to the urheimat of the Slavs. In the first millennium AD, Slavic settlers are likely to have been in contact with other ethnic groups who moved across the East European Plain during the Migration Period. Between the first and ninth centuries, the Sarmatians, Huns, Alans, Avars, Bulgars, and Magyars passed through the Pontic steppe in their westward migrations. Although some of them could have subjugated the region's Slavs, these foreign tribes left little trace in the Slavic lands. The Early Middle Ages also saw Slavic expansion as an agriculturist and beekeeper, hunter, fisher, herder, and trapper people. By the 8th century, the Slavs were the dominant ethnic group on the East European Plain. By 600 AD, the Slavs had split linguistically into southern, western, and eastern branches. The East Slavs practiced "slash-and-burn" agricultural methods which took advantage of the extensive forests in which they settled. This method of agriculture involved clearing tracts of forest with fire, cultivating it and then moving on after a few years. Slash and burn agriculture requires frequent movement, because soil cultivated in this manner only yields good harvests for a few years before exhausting itself, and the reliance on slash and burn agriculture by the East Slavs explains their rapid spread through eastern Europe. The East Slavs flooded Eastern Europe in two streams. 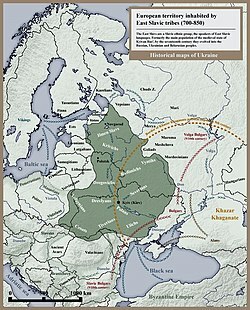 One group of tribes settled along the Dnieper river in what is now Ukraine and Belarus to the North; they then spread northward to the northern Volga valley, east of modern-day Moscow and westward to the basins of the northern Dniester and the Southern Buh rivers in present-day Ukraine and southern Ukraine. Another group of East Slavs moved to the northeast, where they encountered the Varangians of the Rus' Khaganate and established an important regional centre of Novgorod. The same Slavic population also settled the present-day Tver Oblast and the region of Beloozero. Having reached the lands of the Merya near Rostov, they linked up with the Dnieper group of Slavic migrants. In the eighth and ninth centuries, the south branches of East Slavic tribes had to pay tribute to the Khazars, a Turkic-speaking people who adopted Judaism in the late eighth or ninth century and lived in the southern Volga and Caucasus regions. Roughly in the same period, the Ilmen Slavs and Krivichs were dominated by the Varangians of the Rus' Khaganate, who controlled the trade route between the Baltic Sea and the Byzantine Empire. The earliest tribal centres of the East Slavs included Novgorod, Izborsk, Polotsk, Gnezdovo, and Kiev. Archaeology indicates that they appeared at the turn of the tenth century, soon after the Slavs and Finns of Novgorod had rebelled against the Norse and forced them to withdraw to Scandinavia. The reign of Oleg of Novgorod in the early tenth century witnessed the return of the Varangians to Novgorod and relocation of their capital to Kiev on the Dnieper. From this base, the mixed Varangian-Slavic population (known as the Rus) launched several expeditions against Constantinople. At first the ruling elite was primarily Norse, but it was rapidly Slavicized by the mid-century. Sviatoslav I of Kiev (who reigned in the 960s) was the first Rus ruler with a Slavonic name. The disintegration, or parcelling of the polity of Kievan Rus' in the 11th century resulted in considerable population shifts and a political, social, and economic regrouping. The resultant effect of these forces coalescing was the marked emergence of new peoples. While these processes began long before the fall of Kiev, its fall expedited these gradual developments into a significant linguistic and ethnic differentiation among the Rus' people into Ukrainians, Belarusians, and Russians. All of this was emphasized by the subsequent polities these groups migrated into: southwestern and western Rus', where the Ruthenian and later Ukrainian and Belarusian identities developed, was subject to Lithuanian and later Polish influence; whereas the Russian ethnic identity developed in the Muscovite northeast and the Novgorodian north. ^ John Channon & Robert Hudson, Penguin Historical Atlas of Russia (Penguin, 1995), p.16. ^ a b Riasanovsky, Nicholas; Steinberg, Mark D. (2005). A History of Russia (7th ed.). New York: Oxford University Press. pp. 61, 87. ^ Magocsi, Paul Robert (2010). A History of Ukraine: A Land and Its Peoples. Toronto: University of Toronto Press. p. 73. The Tale of Bygone Years is a history of Kievan Rus' from about 850 to 1110, originally compiled in Kiev about 1113. The work’s name originates from the opening sentence of the text, which reads: “These are the narratives of bygone years regarding the origin of the land of Rus’, the first princes of Kiev, and from what source the land of Rus’ had its beginning.” The work is considered to be a fundamental source in the interpretation of the history of the East Slavs. The Chronicle's content is known to us today from several surviving editions and codices that have been revised over the years and evince a slight degree of variation from each other. Turaŭ is a town in the Zhytkavichy District of Gomel Region of Belarus and the former capital of the medieval Principality of Turov and Pinsk. The Severians or Severyans or Siverians were a tribe or tribal union of early East Slavs occupying areas to the east of the middle Dnieper river, and Danube. They are mentioned by the Bavarian Geographer, Emperor Constantine VII (956-959), by Khazars ruler Joseph, and in the Primary Chronicle (1113). The Christianization of Kievan Rus' took place in several stages. In early 867, Patriarch Photius of Constantinople announced to other Orthodox patriarchs that the Rus', baptised by his bishop, took to Christianity with particular enthusiasm. Photius's attempts at Christianizing the country seem to have entailed no lasting consequences, since the Primary Chronicle and other Slavonic sources describe the tenth-century Rus' as firmly entrenched in paganism. Following the Primary Chronicle, the definitive Christianization of Kievan Rus' dates from the year 988, when Vladimir the Great was baptized in Chersonesus and proceeded to baptize his family and people in Kiev. The latter events are traditionally referred to as baptism of Rus' in Russian and Ukrainian literature. The Radimichs were a East ￼￼Slavic tribe of the last several centuries of the 1st millennium, which inhabited upper east parts of the Dnieper down the Sozh River and its tributaries. The name probably derives from the name of the forefather of the tribe - Radim. 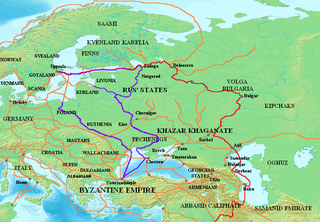 The trade route from the Varangians to the Greeks was a medieval trade route that connected Scandinavia, Kievan Rus' and the Eastern Roman Empire. The route allowed merchants along its length to establish a direct prosperous trade with the Empire, and prompted some of them to settle in the territories of present-day Belarus, Russia and Ukraine. The majority of the route comprised a long-distance waterway, including the Baltic Sea, several rivers flowing into the Baltic Sea, and rivers of the Dnieper river system, with portages on the drainage divides. An alternative route was along the Dniestr river with stops on the Western shore of Black Sea. These more specific sub-routes are sometimes referred to as the Dnieper trade route and Dniestr trade route, respectively. The Principality of Polotsk, also known as the Duchy of Polotsk or the Polotskian Rus', was a medieval principality of the Early East Slavs. The origin and date of state establishment is uncertain. The Russian chronicles mention Polotsk being conquered by Vladimir the Great, and thereafter it became associated with the Rurik dynasty and Kievan Rus'. The Lendians were a West Slavic tribe who lived in the area of East Lesser Poland and Cherven Towns between the 7th and 11th centuries. The Varangians was the name given by Greeks, Rus' people, and others to Vikings, who between the 9th and 11th centuries, ruled the medieval state of Kievan Rus', settled among many territories of modern Belarus, Russia, and Ukraine, and formed the Byzantine Varangian Guard. According to the 12th century Kievan Primary Chronicle, a group of Varangians known as the Rus' settled in Novgorod in 862 under the leadership of Rurik. Before Rurik, the Rus' might have ruled an earlier hypothetical polity. Rurik's relative Oleg conquered Kiev in 882 and established the state of Kievan Rus', which was later ruled by Rurik's descendants.